Monday, June 21st marked the First day of the week of Resistance to Abolish the G8 and G20 in Toronto. Demonstrators converged downtown in the first of many mobilizations, as G8 and G20 leaders meet in Huntsville and Toronto later this week. Actions have been called by multiple community organizations, ranging from peaceful rallies to confrontational direct action. Monday’s themed day of resistance focused on migrant justice, an end to war and occupation, income equity and community control over resources. 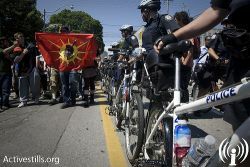 The first street action of the week began at 2pm in Allan Gardens, and marched down Dundas Street and up Yonge street to the Children’s Aid Society of Toronto headquarters. The March, titled ‘All Out in Defense of the Rights of All’, was organized by autonomous ant-poverty groups Kingston Coalition Against Poverty, Sense of Security from Guelph, and Stratford Action for Equality. This podcast was produced at the Alternative Media Center in Toronto. the AMC is a temporary, autonomous media making space for independent journalists to cover the G8 and G20 summits.